Rolling up to the crater’s edge, the Opportunity rover took in a landscape unlike anything any Earthling had ever seen. A vast, meteorite-blasted expanse of volcanic rock and iron oxide extended for 15 miles, ringed by rugged mountains under a dusky orange sky. In months to come, the enterprising robot would uncover signs that warm, liquid water had altered these ancient rocks - evidence that the conditions for life once existed on Mars. And although she was sitting a hundred million miles away, in Mission Control at the Jet Propulsion Laboratory in Pasadena, California, in that moment Stroupe felt like the astronaut she'd grown up always wanting to be. Opportunity had allowed her, and her fellow scientists, and her fellow humans, to experience another world. Opportunity's historic mission, which uncovered signs of Mars' watery past and transformed our understanding of the Red Planet, has finally come to an end after 15 years, NASA declared Wednesday. 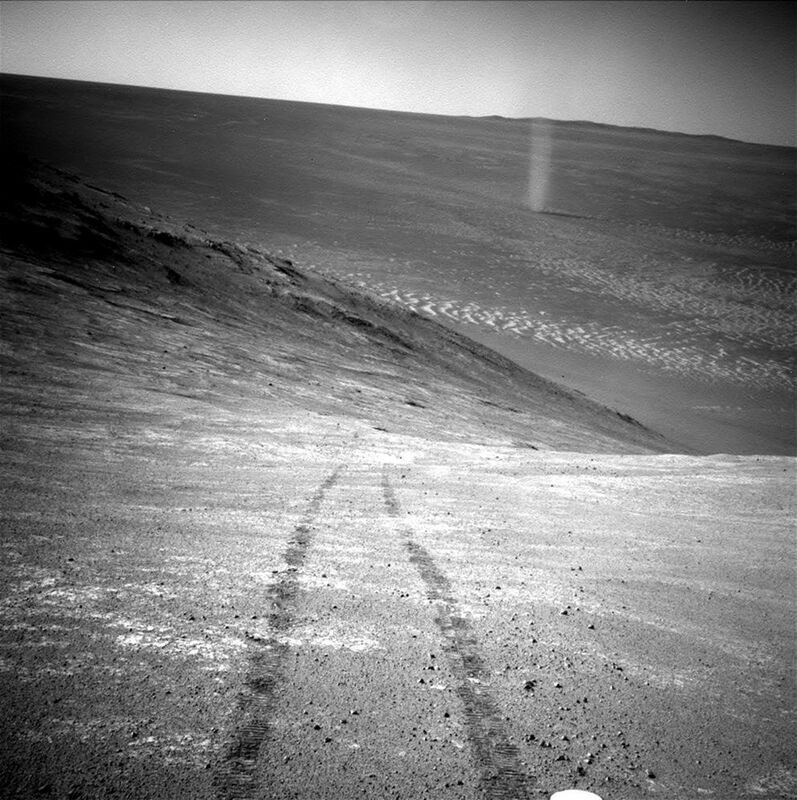 Opportunity's mission was planned to last just 90 days, but it worked for 5,000 Martian "sols" (which are about 39 minutes longer than an Earth day) and traversed more than 28 treacherous miles - two records for NASA. Before 2000, when NASA announced its ambitious plan for the Mars Exploration Rover (MER) mission, just three spacecraft had ever successfully operated on the Red Planet. Of these, only one - the tiny Sojourner rover that accompanied the 1997 Pathfinder mission - moved around on the surface. It never traveled more than 100 meters and lasted less than thee months. The agency's chief scientist, Ed Weiler, called the failures "a wake-up call." For years, NASA had pursued a "better, faster, cheaper" exploration strategy, attempting to use a shrinking budget to send several small missions into space. But now critics began to question the merits of the Mars program altogether. What could this desolate planet possibly teach us that would be worth the expense? Shortly after the crashes, Cornell University planetary scientist Steve Squyres got an unexpected phone call. He'd been trying to persuade NASA to send a sophisticated robotic geologist to Mars for more than a decade. Now the agency wanted to know - could he have his idea ready to launch by 2003? "We only had 34 months between when NASA said, 'OK. Ready, set, go!' and when we had to be on top of the rockets in Florida," Squyres said. "People say to me, 'Oh my goodness, it's a miracle the rover lasted so long on Mars,' and I want to go, 'It's a miracle they got to the launchpad.'" To the East, he watched Mars - just a little red dot - rise over the glittering black Atlantic. It was hard to imagine how the rovers would ever get there, Squyres said. Mars seemed so forbidding, so alien, so impossibly far away. Opportunity launched into space aboard a Delta II rocket on July 7, 2003, three weeks after its sibling, Spirit, took off. 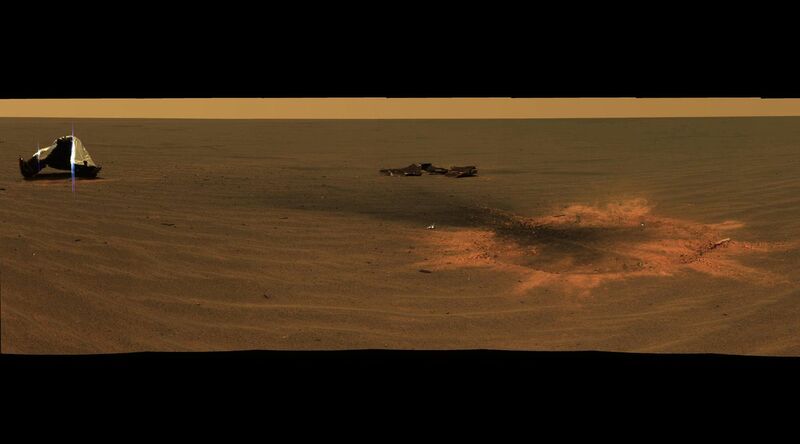 The cruise was uneventful, and seven months later, on Jan. 25, 2004, Opportunity prepared to touch down in Mars' Meridiani Planum, a low-lying cratered expanse in Mars' southern hemisphere. The logistics of the MER rover landings were formidable, bordering on absurd. Within six minutes of entering Mars' thin carbon dioxide atmosphere, the spacecraft had to slow from 12,000 mph to just about 0. Right before impact, a cocoon of air bags inflated around the spacecraft, allowing it to bounce safely onto the surface of the Red Planet. Planetary scientist Abigail Fraeman, then 16, had been invited out to JPL as part of a Planetary Society program for high school students. She can still summon every detail of that night. The tones that rang out as each system was found healthy. The images that Opportunity sent down from its landing site of a smooth dark plain so vivid and sharp she almost felt she could reach out and touch it. The surge of elation that swept through the science team as researchers realized what they'd landed on: layers of exposed bedrock that would reveal clues about Mars' geologic history stretching back billions of years. 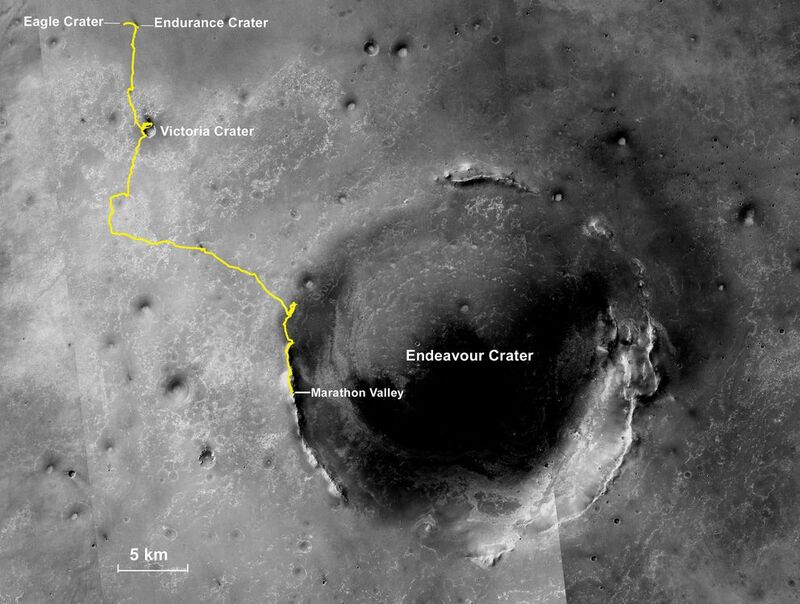 Opportunity's first great achievement came within two months of its arrival on the Red Planet. The layered outcrop on which the rover had landed - the one that made the scientists surrounding Fraeman jump for joy - contained evidence that water once flowed through the rocks: crystals, sulfur compounds, little spherical objects that scientists likened to blueberries, and rock patterns that looked like sediments laid down by a flowing current. "It really changed the way scientists perceive Mars," said Squyres, who has been principal investigator for the instruments aboard Spirit and Opportunity since the beginning of their mission. "It is a cold and desolate world today, but in the distant past, in the time that the rocks explored by Spirit and Opportunity were formed, it was a very different world. It was a world that was more Earthlike, a time when life was emerging on Earth." "Being able to really roll right up to an outcrop and examine it, to look up close with your hand lens, do the chemistry measurements . . . it allows you to really feel like you're there," she said. "That absolutely changed the way we go about doing planetary exploration." The MER mission's cultural legacy is just as wide-reaching. The intrepid rovers, with their humanlike proportions and endearing, Wall-E-esque antics, proved phenomenal ambassadors for the Mars program. Middle school science classes tracked the rovers' progress across the Martian landscape. A Twitter account shared selfies and snarky comments in the spacecraft's voice. Even the scientists who operated the spacecraft couldn't help but anthropomorphize them. Stroupe, the JPL engineer, jokes that Spirit and Opportunity had "the dynamic of being rival siblings." Spirit, which landed on Mars first, faced much tougher terrain and suffered several breakdowns, culminating in the rover's eventual loss of contact in 2010. The charmed rover barely escaped becoming trapped in a sand dune in 2005, survived a global dust storm in 2007, and undertook the longest-ever traverse performed by a rover - the three-year journey from its landing site at Victoria Crater to Endeavour Crater, 13 miles away. She calls Spirit and Opportunity "the first Martians" - the first things to live and work longer on another planet than they ever did on Earth. The spacecraft had survived such storms before. But at more than 14 years old, it was no longer as hardy as it had once been. A fault in one of Opportunity's memory banks resulted in loss of all long-term memory. Problems with the rover's wheels and robotic arm looked like spacecraft arthritis. If Opportunity experienced another prolonged power loss, it might not recover so easily. When the storm finally began to subside, in September, NASA adopted a “sweep and beep” strategy for waking the rover, sending commands multiple times per day. Except for a few false alarms from other spacecraft - NASA’s Mars Reconnaissance Orbiter transmits on a similar frequency - scientists heard nothing back. Still, the team held out hope. If the storm had deposited dust on Opportunity's solar panels, the coming windy season - which runs from November to January - might help sweep them clean. 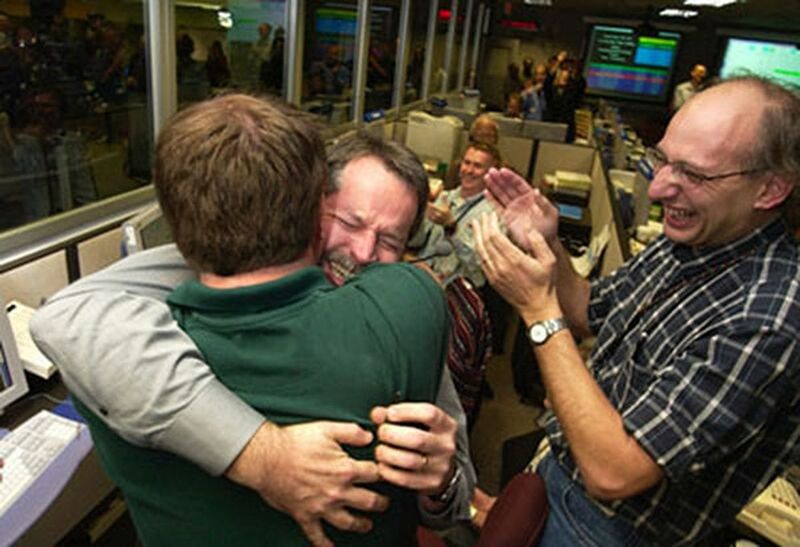 "We've reached the end of the road," said NASA's associate administrator for science, Thomas Zurbuchen. "We've exhausted all the good ideas [for waking the rover] . . . and now we declare the mission as being complete." "I always knew it was going to end," he said. "And boy, if this is the end . . . getting killed by one of the most ferocious storms we have ever seen. Well, you can walk away from that with your head held high."